Agriculture has always been important to the community, with rich soil that supports diverse crops such as turnips, beans, and a variety of grains. GRIEVE or STEWARD was the ‘foreman’ who gave the farm servants their daily orders and supervised their work. Especially on the very large farms, the servants might often see little of the farmer who used the grieve for passing on all instructions and for receiving reports of how work was progressing. Many grieves worked alongside the servants to ensure a proper pace of work. Not surprisingly, many grieves were not much liked by the farm servants! PLOUGHMEN were the most highly skilled of all farm servants and so can be seen as being at the pinnacle of farm servant society. Ploughmen also had their own internal hierarchy so that the best, most experienced man was the first ploughman (who usually had the best horses as well), then the second ploughman and so on down the line. Ploughmen tended to be quite a proud breed and often felt aggrieved if given work not involving their horses. Ploughing took up a lot of their time since fields were usually ploughed multiple times each season. Each ploughman looked after his own horse pair. CATTLEMEN The cattlemen also saw themselves as skilled workers and some would have put themselves on a par with the ploughmen - although the latter would have disagreed! When cattle were indoors or in farmyard cattle courts in the winter, there was a lot to do - mucking out (which some farmers insisted on being done every few days), putting in fresh straw for bedding, feeding the beasts hay and chopped turnips and, sometimes, having to go out to the fields themselves to fetch turnips. And they were always alert for illness among the beasts. Cattlemen would sometimes need help from the orra-men at busier times. SHEPHERDS were usually quite independent figures, especially if their cottage was somewhere out in the hills, well away from the farm. Even the grieve might have only occasional contact, trusting the shepherd to get on with the work. When sheep had to be clipped or dipped, the shepherd needed extra hands but, otherwise, he tended the flocks out on the hill pastures in all weathers, watching out for predators and disease and moving the sheep around as required. On farms where the sheep were in fields in closer proximity to the farmyard, the shepherd’s work would be not so demanding. ORRA-MEN ‘Orra’ means ‘other’ or ‘extra’ and so the orra-men were the servants who did all the other, mainly unskilled jobs. 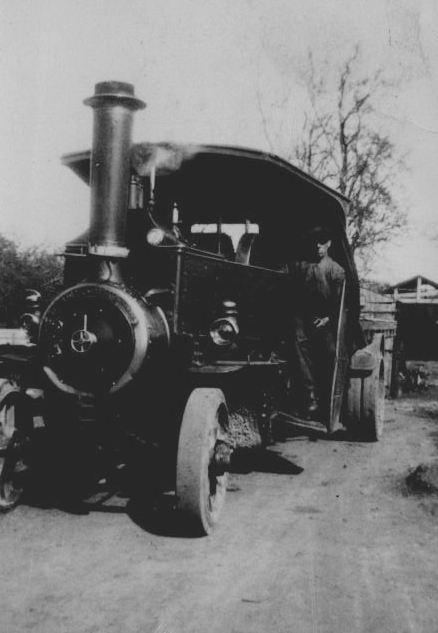 Their work was vital at the busy times of year - hay cutting, grain harvest, potato and turnip lifting - but there was an endless round of other tasks. 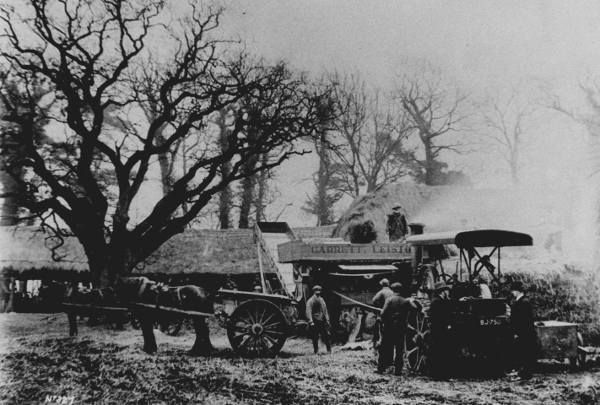 There were dry-stane dykes to be built or repaired, hedges to be cut (using the hedge knife), ditches to be dug or cleaned out, manure or lime to be spread on the fields, buildings to be kept in order. The list would be endless. Where a horse and cart was required for any such work, they spoke of the ‘orra’ horse; one of the ploughmen’s horses would hardly be used for such menial jobs! BONDAGERS It was universal practice throughout Northumberland for farm servants - especially if they were living in one of the farm cottages - to be required to supply a ‘bondager’. This was a woman, often the servant’s wife or an older daughter, who worked in the fields on any days when the farmer/grieve required that extra labour. On many farms, the bondagers would find themselves out on at least half the days in the year and sometimes more than that. The bondager system was controversial and was phased out in most places by the 1860s and 1870s. HINDS There is confusion about the meaning of this word. Sometimes it refers to all farm servants and sometimes only to skilled workers. Farm servants were often only employed for one year. To get another job on a different farm, they had to attend the annual March Hirings on 12th May in places like Wooler, Alnwick or Berwick. The servant's chances of being hired were greatly increased if he could offer a bondager too. At the hiring fair, work hours and a wage would be agreed for both, as well as accommodation, potatoes, corn and other perks. After the March hirings, came ‘flitting day’when the servant and his family might move home. The new employer would provide carts and horses and the family would pile all their belongings, children, pig, chickens and pets to move to the new farm. Most servants and their families lived rent free on the farm often living in the rows of farm cottages that can still be seen in most Northumberland villages today. Families in the 19th century were usually large and there were wall beds in the downstairs room and some more upstairs, if there was an upstairs. Water had to be carried in pails from a well and there would be a dry toilet outside in a hut. Cooking had to be done on an open fire. Later there may have been a hot water tank and an oven on either side of the fire. The families usually kept a cow, a pig and some hens. They would be supplied with potatoes and grain from the farmer and would be able to grow vegetables. The hours were long and the work often back-breaking and needed to be undertaken in all weathers but, mostly, they were healthy and well-fed. “I don’t know when Jean Hutchison got the tenancy of Hotel Lands (photos below) from the then Collingwood Estate although that could probably be found in the estate records. 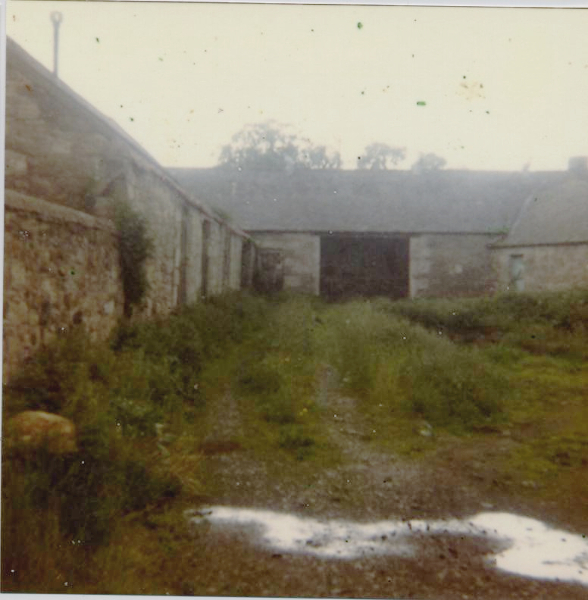 I do know she was farming the 70 acres from the cottage that lies between Mamie Simpson’s and the old schoolhouse when we came to Cramond Hill in September 1951. She left sometime in 1956. Nor do I know her early history, but believe that she was born locally and dressed like a man from her girlhood. When I first knew her in the early 1950’s she usually wore a shirt and jacket, flat cap, heavy corduroy trousers and boots. She had a dark, weather-beaten complexion, not many teeth and a working farmer’s hands. She shared the cottage with two sisters, one named Mame, but can’t remember the name of the other. There were also two German former prisoners of war who worked on the small farm. I’m not certain if they stayed in the cottage with the three sisters or not. Mame wore a dress, usually with wellingtons and a big apron. She’s the one I remember bringing cows through the village from fields behind where the railway station was, where Station Gardens now is. 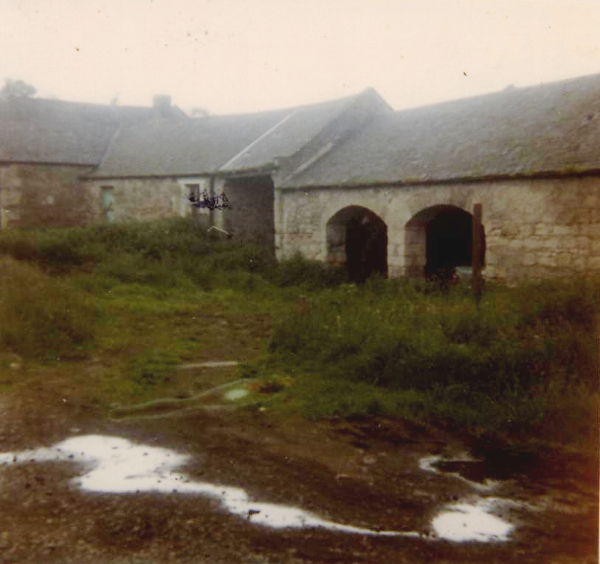 They were brought in and milked in what was the Hotel Lands steading behind the Collingwood Arms. This is now detached houses. 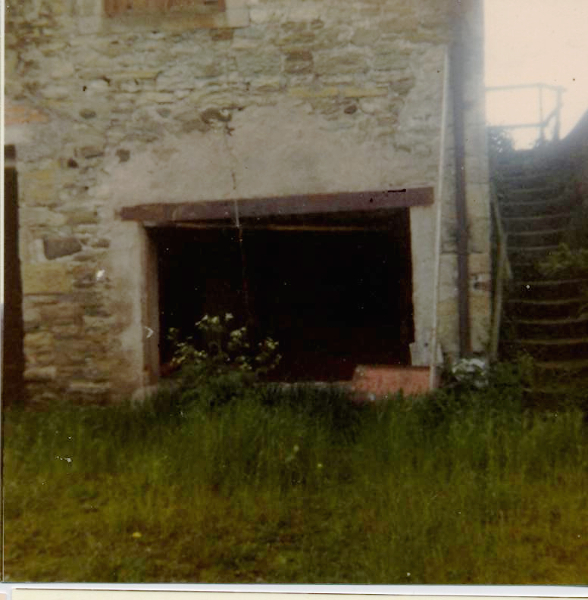 At that time (1950s) there was a two-storey granary (photos below), a byre and several small outbuildings, used to keep hens and possibly pigs and a tumbledown shed/garage (photo below) made of sleepers. 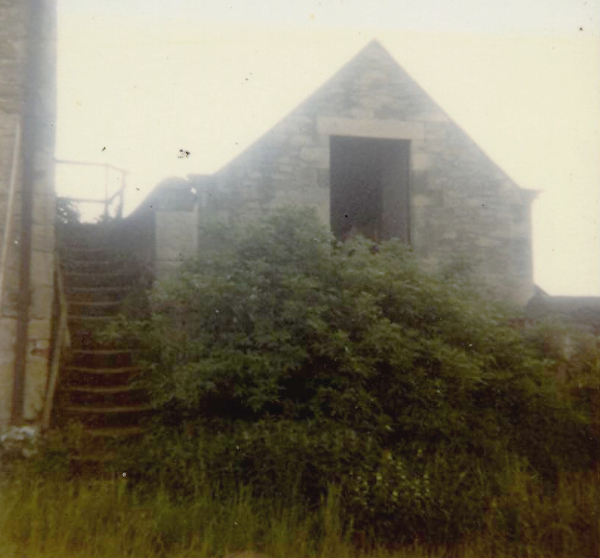 Bags of grain weighing up to two hundredweights (slightly more than 100 kilos) were carried up an outside flight of stone steps to the upper granary. These four photos are taken from left to right. 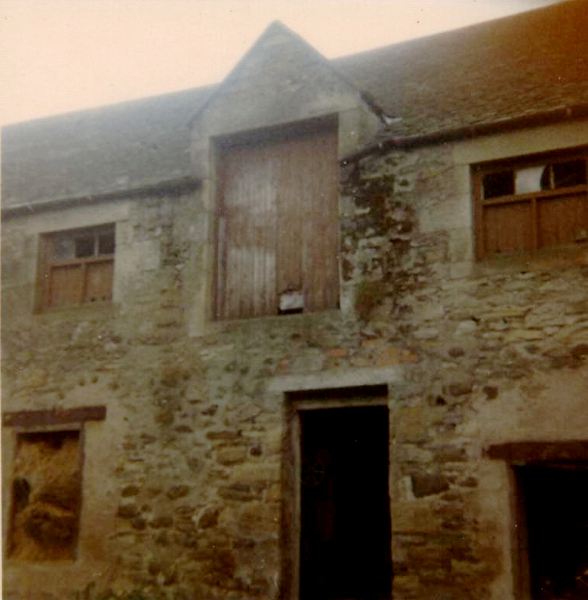 They show the two-storey granary. 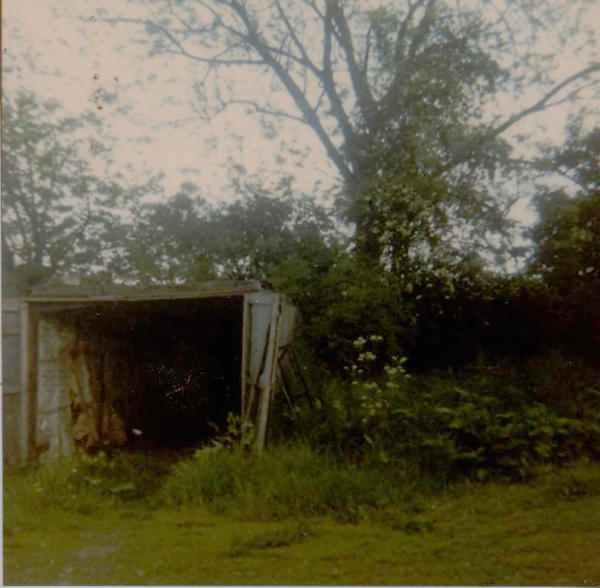 The shed/garage made of sleepers. 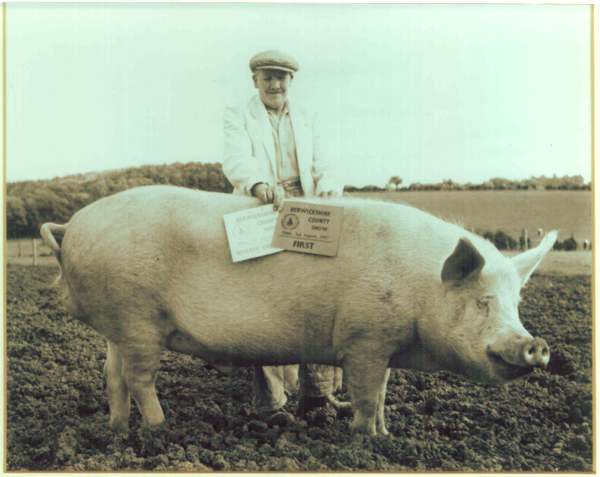 Maybe this was home for the prize pig? The 70 acres ran two fields wide from the station up towards Cramond Hill. One field was always referred to as Jean’s Field. Another was The Covert and, of course, the Station Field. 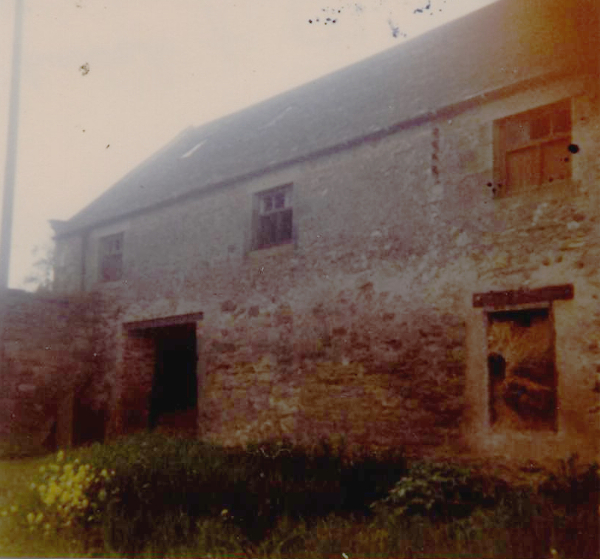 Jean and the sisters worked hard, but the land and a small herd of Dairy Shorthorn cows would not have been enough to support them plus two workers even if she had been a much better farmer than she was. Dealers looking for cheap grazing for sheep and cattle also took advantage of her. The net result was that in 1956 she was forced to give up the farm. Jean, and possibly Mame to begin with, was then employed at Jim McGregor’s farm Coldstream Mains to milk a herd of Red Poll cattle. She worked there for some years.